The discussion about whether home is still the right or safe place for an aging parent should start with whether an older adult wishes to stay in their lifelong home or not. Some older adults are ready for a move, whether it is just to downsize the responsibilities of home ownership or to move to a warmer climate. But if they really want to stay where they are, the next conversation can then focus on what can be done to allow that to happen, but only if the choice is to stay and age in place. This is going to be the first in a two-part series about helping an older parent maintain independent living within their own homes. I have talked about some of the hardware-related issues in earlier posts, but this is more about lifestyle changes. Emergencies Just Happen. There are a lot of options to make an elder’s home safer from falls. But, a fall or some other medical emergency can occur no matter how hard we try to prevent one. Make sure you have copies of all the important phone numbers in case of a medical emergency, especially if you live in another town away from your parents’ home. And be sure that this includes the local hospital, the primary care physician, any medical specialists and even the phone number of a neighbor or two who can step up if called upon. Also, keep current with any diagnoses or medications that your older parent currently takes. Unheard of Problems. Hearing loss is typically a slow process of degradation. It may not be noticeable to those whom your parent sees everyday. But you take care of a Chicago senior living some distance away, note any change you may notice since your last visit. It is not just that you want your parent to benefit from optimal hearing – when one loses hearing, it is harder to even talk on the phone. Add up the difficulties in social situations and the inability to reach out with phone calls, and an older adult is at risk for becoming isolated which ultimately fuels melancholy and depression. Vision Too. Older adults who have progressively lost visual acuity also are at risk for the same isolation that deafness can produce. 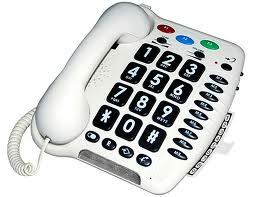 If it is hard to see the buttons on a telephone it becomes just as hard to reach out to others as when one loses hearing. But if your older parent does have a decline in seeing or hearing, it does not mean that they cannot be socially active, but you may have to get help in the way of transportation, organization social venues and the like.